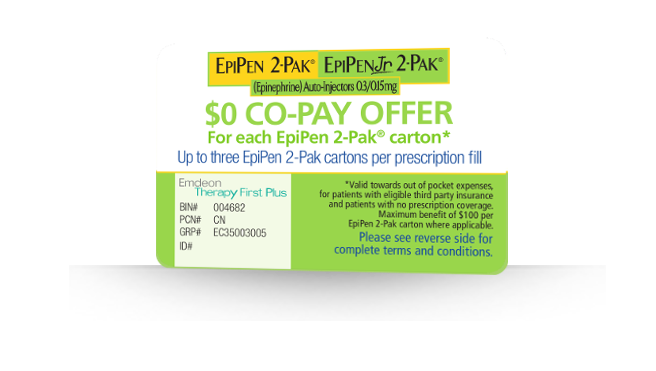 The EpiPen Auto-Injector $0 Co-Pay Offer helps eligible patients save on out-of-pocket costs for up to $100 per each EpiPen 2-Pak carton. It will cover up to 3 EpiPen 2-Pak cartons per prescription fill. Just present your card at the pharmacy each time you drop off or refill your prescription! Click here to find the $0 co-pay form from Mylan (makers of Epi Pen). It's good for up to three EpiPen 2-Pak or EpiPen Jr 2-Pak cartons at a time, so you can have several EpiPen 2-Pak cartons available in different locations. Take your prescription and the $0 copay card to your pharmacy and get your free epi-pens! This offer ends December 2014 according to the Mylan site. See more terms and conditions from Mylan here.